The SIP protocol has already becomes an industry standard for VoIP. Thousands of telephone companies, IP phone manufacturers and IP based PBX systems, such as Asterisk, Trixbox, are using this protocol to connect calls. However, Skype is becoming popular and occupying the biggest share in VoIP market. 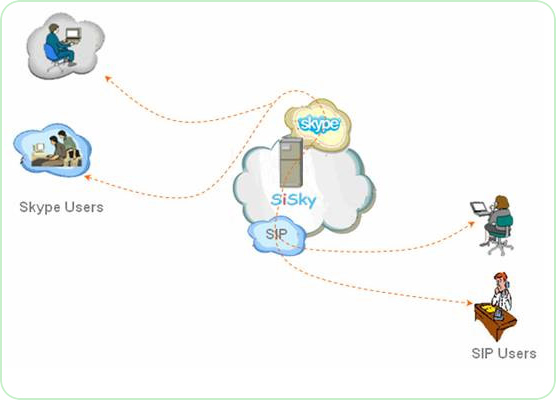 Yeastar provides business class solution to connect calls between SIP and Skype. Supports 30 concurrent calls on one computer. Supports cascade connection of multiple computers to extend unlimited channels. Incoming Skype call can be forward to an idle channel automatically. Incoming SIP call can be forward to an idle channel automatically. Define Direct-Line or Dial Rule to match your dial plan. Quick and easy operation and no training required.